I’ve always wondered if cleaning a tiled floor with a single toothbrush was actually possible. Well, I’m sure it’s possible but I’m sure it’s not pleasant. The same thing goes for organizing a large scale event without Salesforce. It's possible, but definitely not pleasant. Much like scrubbing a large floor, planning a large scale event requires the right tools for a job well done. But unlike a mop or Swiffer, Salesforce can be intimidating. For those unfamiliar, Salesforce (or SFDC which stands for Salesforce Dot Com) is a leading CRM software with an incredible array of capabilities. With Salesforce you can organize and analyze your entire sales data, helping you and your team make crucial business decisions that affect the future of the company. Using Salesforce as part of your event marketing strategy is a great way to organize and analyze all of your valuable event data. To ensure that you’re taking full advantage of Salesforce as a supplementary resource to your event strategy (and are not doing the equivalent of cleaning a tiled floor with a toothbrush), here are 10 tips on how to make the most of SFDC as an event marketer. One of Salesforce’s main value propositions is its ability to offer a high level overview of multiple initiatives at the same time. Comparing display ad, paid social, paid search, and various other campaigns simultaneously is very helpful when drawing insights to make important decisions. It’s important to view each initiative as its own separate campaign so that you can better understand the individual impact of each campaign. Every live event should be categorized as its own separate campaign within Salesforce. By doing so, you’re able to clearly determine their overall impact and how they compares to other initiatives. Additionally, you’ll begin to view events as a completely separate marketing channel which in turn will allow you to organize events as their own separate strategies. For event marketers, the value of Salesforce comes from their event data being directly accessible from within the Salesforce software. However, this is not possible if Salesforce is not synced with the event marketer’s default event management system. Before your event marketing strategy kicks off, make sure your main event software is integrated with Salesforce. This will make life a whole lot easier by saving both time and energy. Eliminating the need to manually upload event data doesn’t only save you time but also reduces the possibility of making mistakes during the process. Clean data is necessary for drawing insights and integrating Salesforce to your core event software will help you achieve that objective. Setting up a parent campaign in Salesforce is a great way to capture a high level overview of multiple initiatives within the same campaign. This feature is particularly helpful if your marketing team plans an event series that takes place in multiple locations. By setting up a parent campaign for a series of events, you’re able to see each event’s performance side by side. For instance, you might notice that a particular event received more early bird registrations in the London than it did in San Francisco. Maybe the same event in New York City had lackluster post event surveys. All of these key insights are much easier to see how all events are performing compared to one another. As you’re creating the campaign in Salesforce, make sure you as a marketer are staying in constant communication with your sales team. In fact, it would be best to sit down with the relevant sales reps before creating the campaign to make sure everyone is on the same page. For example, if a person registers for the event, will they be treated as a sales lead or a sales opportunity? How should the team follow up with prospects after the event? What type of data is absolutely necessary to upload in Salesforce? All of these questions should be answered in collaboration with your sales team so that all of Salesforce data is as clean and accurate as possible. Whether as an organizer or an attendee, the event marketer’s strategy begins well before the event start date. Similarly, reporting in Salesforce should begin well before the event is in progress. Often times, large conferences will provide a way for attendees to connect with one another months in advance. 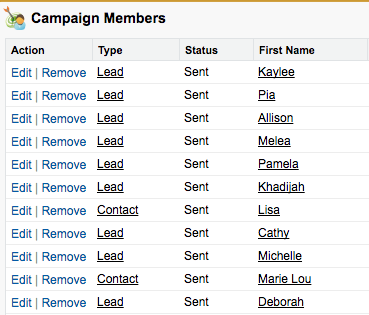 Within the Salesforce campaign, keep track of all the leads that you connect with prior to the event. This will provide a much easier way to develop a meet-and-greet strategy once you get to the event as well as create a follow-up strategy once the event is over. Learn how to get even more out of Saleforce in the Live Event Lead Generation Guide. Click the button below to get your copy now. If you are attending an event and are looking to collect leads as an exhibitor, it is crucial to record the people who visit your booth. Collecting leads is oftentimes one of the main reasons that companies attend events, so if you do not have a thorough system of tracking all potential prospects you meet, it defeats the purpose of not only going to the event but also of using a tool like Salesforce. Make sure your event team is completely aligned on how to capture contact data from anyone who comes to talk with you at the booth. Once a lead enters their data, make sure their info uploads directly to Salesforce in order for your team to correctly attribute the lead source to the event. Once the event comes to a close, following up with prospects becomes the main focus. Strategize a tailored outreach campaign for all of the leads you captured during the event. You may even want to categorize the leads into different levels of interest depending on how granular your on-site event data is. Then, sync your email correspondence with Salesforce to make sure all replies from prospects are immediately updated within the system. This will be provide a seamless way for you to keep track of which prospects have the highest potential of closing. Your Salesforce data is only as useful as it is accurate. So be sure that all team members are on the same page in terms of qualifying contacts and deal stages. If a lead from an event reached back out to your sales team, is that considered a sales opportunity? If the person has not yet discussed a possible deal amount, are they still considered an opportunity? Make sure the criteria is clearly communicated and consistent throughout so that all of the info entered into Salesforce is reliable. As your sales team continues to communicate with their leads, the prospects will turn into potential business deals. In alignment with your sales team, assign a specific monetary value to each lead so you have an accurate vision of your pipeline. In the end, the main objective of events for many is to create business opportunities that can drive revenue. Assigning monetary value to each sales opportunity creates a more comprehensive view of the event’s impact on the overall business model. You can learn more about attributing and tracking event ROI in this guide. Once a value is assigned to a lead that resulted from your event marketing initiative, make sure to check in on the value and ensure that it is accurate. If a prospect decides to choose another vendor, the pipeline value must reflect that. If a lead “goes dark” and does not respond to multiple emails, that value should also be eliminated from the pipeline. Everyone involved with the event campaign in Salesforce should be disciplined in their pipeline cleaning to ensure that the impact of the event is accurately reflected within the system. There are countless other tips you can find on using Salesforce but these ten should be helpful for event marketers looking to use CRM software for their event strategy. In the end, Salesforce is a platform that creates a much more efficient and streamlined planning process but it falls to each event organizer to understand how the software can best suit their individual needs. Be specific and aligned with your end goals and that floor will be clean in no time. For even more event planning resources, click the button below.